Many small businesses often overlook the project management position, but when a business owner starts taking on more business they tend to become swamped with balancing daily operations, payroll, accounting, and projects. According to Kundan Pandey, “it is an essential segment in every organization. Be it the small scale enterprises or corporate giants, project management has the power to transform the market standing of a company and help it soar high in the sky” (http://www.buzzle.com/articles/why-is-project-management-important.html). Wondering how project management could apply to your business? Well, take for example a local coffee house. Currently the owner can only afford 3 baristas and wants to increase the efficiency at work due to an increase of customers and by assigning part-time project management duties to one of the 3 employees and having that person coordinate a set of schedules and procedures for operations (from ringing up a customer’s order to preparing the beverage). Even with 2.5 baristas, the efficiency of operation is increased and the coffee shop employees can serve customers quicker and reduce mistakes. Having a project manager for your business will often show positive results right away. Why is project management useful? By implementing a project management system to a business, it becomes the framework and foundation of a business, whether facing a crisis or trying to turnover a project, it can become the pivot for company growth. Some items that good project management can do are improve quality, reduce risk, promote communication, and help strategize objectives and goals. 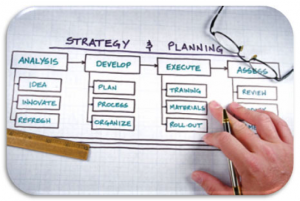 Check out this traditional framework of project management. 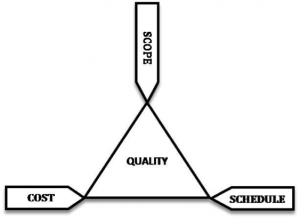 The triangle explains the structure of how scope correlates to the cost and schedule and forms the improvement of quality. To illustrate what we are explaining about project management, we will take a look at one of Ready Artwork’s older blog post about quality control. The necessary steps involved in our quality control process are only a small system within a larger system of project management. Without our project management process, client projects may become backlogged. Project management has become more relevant in all types of businesses, small or large. Whether it is for a large aerospace firm or a small businesses OEM project, by having a planned system ready, all businesses and their customers will benefit.